SHANGHAI: The debut of gold futures trading on the Shanghai Futures Exchange Wednesday marked a milestone in the development of country's financial market and the city as an international center. At the ceremony to mark the opening of trading, Shang Fulin, chairman of the China Securities Regulatory Commission, said the introduction of gold futures contracts "will help expand the scope of the futures market which is playing an increasingly important role in stabilizing the financial markets and serving national economic growth". Gold futures trading is also widely seen to add to the strength of Shanghai as a financial center of the nation. Feng Guoqin, deputy mayor of Shanghai, said: "Gold futures trading reflects the quickening pace of the development of Shanghai as an international financial center." In yesterday's trading, the most actively traded contract for delivery in June settled at 224.74 yuan ($30.9) per gram, up 6.34 percent from the opening price. And the contract for delivery in December was 229.93 yuan ($31.6) per gram, up 8.86 percent. The total turnover of all contracts amounted to 27.3 billion yuan ($3.75 billion). The first deal was closed between China National Gold Group and Jiangxi Copper Company. Jiangxi Copper bought from China National Gold 1 contract in a 1,000 gram denomination. Wang Chiwei, vice-president of Jiangxi Copper, said he had been hoping for a long time to be able to hedge against price risks by trading gold futures in the domestic market. "As a company operating gold processing business, Jiangxi Copper needs a hedging tool to avoid risks resulting from price swings to ensure steady profits." According to Wang, it usually takes four months for a processor to refine copper concentrates into gold products for delivery. The low processing fee, at $5 per ounce, can easily be wiped out by a small movement in the price of gold in the wrong direction. "Without an effective hedging tool, the price movements at any time of the 4-month work cycle will bite off a big chunk of the refining fee," Wang added. "The judicious use of gold futures in the domestic market trading in renminbi can enable Chinese enterprises to increase their competitive edge in the global market." When the global economy was strong, currencies were stable and inflation was low - as in the past several years - the gold market was in the doldrums and prices of the metal hardly moved. Not anymore. The worsening US credit crisis, coupled with the weakening US dollar and escalating oil prices, have driven gold prices to unprecedented highs. Last month, the international price of gold surged an aggregate 11.3 percent. The most actively traded contract on New York Mercantile Exchange (NYMEX) for delivery in February hit a record high of $894.4 per ounce in yesterday's pit trading. 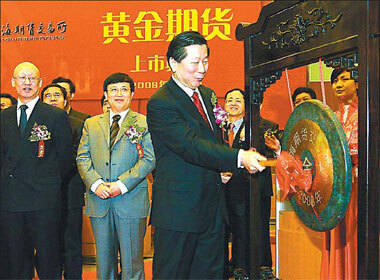 Shi Min, president of Shandong Gold Group Co, said that the introduction of gold futures benefits numerous gold miners and processors in China by providing an effective tool to hedge against price fluctuations, especially at a time when the international gold market is showing increasing volatility arising from the weakening US dollar. "The launch of gold futures is very timely," Shi said. "When gold prices are touching record high levels, gold producers are in much more need to hedge against high volatility resulting from sudden changes in market sentiment in these highly uncertain times." Traders and industrial experts believe that the expected rise in gold output as well as consumption by China this year would help the newly established futures market gain influence in setting global prices in the foreseeable future. Jeffrey Christian, president of CPM Group, a leading global commodities research and consulting company based in New York, told China Daily: "China will be the largest producer of gold from mines, a major refiner, and a major user in fabricated jewelry. It will also become a major investment market. It will gain influence on gold prices. "Our expectation is that trading will start off relatively modestly in terms of volume, but could build later," said Christian. "Chinese market participants should remember that when US and Japanese gold futures trading began, in the 1970s and 1980s, their volumes were initially low, but later they became major markets. The same could happen, and may well happen, with Chinese markets."